While there is no shortage of Moskvich/IZh 412s floating around in Russia, one of these compact sedans are an unthinkably rare sight in the US. The seller of this 412 claims it is the only privately owned example of the vehicle in the entire country—a wild claim which we completely believe. Last weekend we showed you a field full of rotting Russian relics featuring a 412, which made the idea of car hunting in the massive country seem like a bizarrely attractive possibility. While our interest in Russian car hunting was more a fleeting thought than an actual plan, the seller of this IZh (we think) was obviously completely serious about owning old Russian Iron when they made the decision to import this car a few years ago. Once you get past the extreme novelty of this 412, the car has a claimed 36k original miles, which has to explain the car's surprising decent condition after 39 years. Certainly the build quality is questionable, the interior no frills and the prospect of finding parts terrifying, but this rare and odd little sedan appeals to us. With a little over three days left bidding on this Russian oddity has reached $3,050 with the reserve still not met. 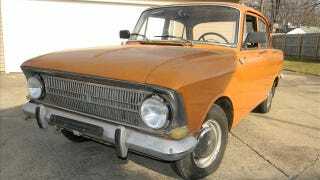 Anyone looking for a Moskvich/IZh 412 who doesn't have the desire to complete the presumably nightmarish process of trying to import one has no choice but to purchase this car. For this reason and assuming the reserve is somewhat reasonable, we'd guess when the auction ends Wednesday this 412 will have found a new owner.